Pigeon isn’t what most think of when you say you are having bird for dinner. 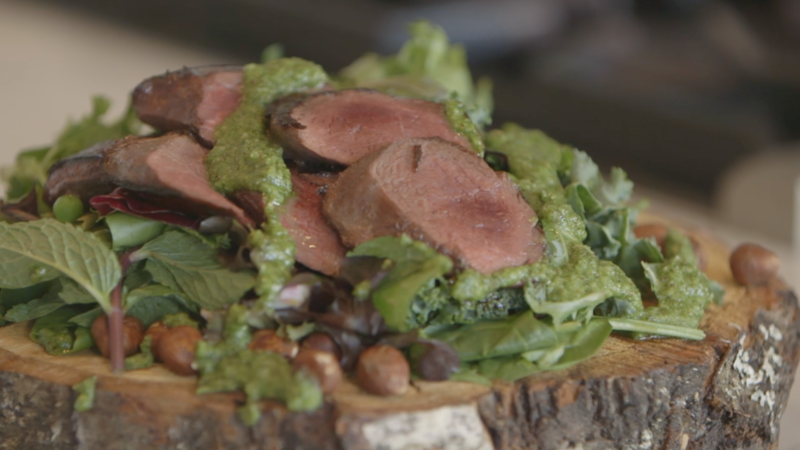 Please note that for this recipe, Dan used wild pigeon – Dan did not get some city slicker pigeon. • Place frying pan on medium-high heat, and once hot, add 2 tablespoons canola oil. • Season 2 pigeon breasts liberally with salt. Place into hot pan, laying breasts away from you to avoid oil splattering. Cook 2 minutes on first side until browned, and then flip over. Cook 1 minute on the second side, turn off the heat and let the breast rest in the pan to finish cooking. • To make hazelnut pesto: If using hand blender, place the following ingredients into a high-rimmed bowl. Or place all ingredients into a food processor or blender: ¼ cup grated parmesan cheese, ¼ cup roasted hazelnuts, 2 cups arugula, juice of half lemon, salt and pepper, 10 leaves basil, small bunch parsley and hazelnut oil. • Slice the pigeon breast and rest on your fresh greens. Add peas and extra hazelnuts and drizzle with the hazelnut pesto.